Ever thought that your imagination could do wonders for your health? The hectic lifestyle significantly demands some fascinating ways to relegate stress. Are you fed up of those tedious yoga sessions, and meditation isn't your cup of tea? Why not bring out the hidden artist in yourself with a drawing or painting session? Well, invoking your creativity on a canvas is perhaps the most excellent way of comforting your mood! Don’t expect to deliver a magnum opus in the beginning - your key focus is improving overall health. 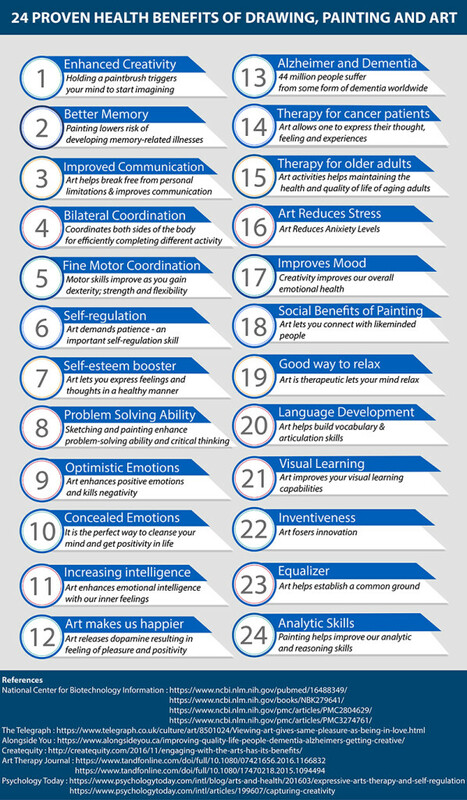 Here are 24 proven health benefits of drawing, painting and art that promote mental health and improve your overall quality of life. Holding a paintbrush triggers your mind to start imagining. Your brain works precisely to envision vivid colors, striking places, people, and a lot more. Often you end up representing your emotions via your art. 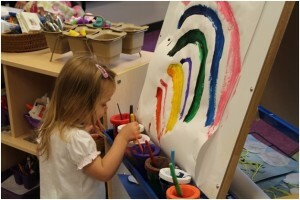 Artistic skills play a significant role in the overall development of the brain. Involving oneself in some creative work quickly releases stress, and calms the temper. These activities are recommended for teenagers to ensure adequate brain development. For people having memory issues, creating masterpieces with colors could be the finest thing. Painting boosts your memory skills. People who are involved in drawing, writing, and painting are at a lower risk of developing memory-related illnesses during their older age. A study published in The Quarterly Journal of Experimental Psychology suggested that drawn words were better recalled than written. According to the study, drawing strengthens memory by perfectly integrating visual, semantic, and motor aspects of the memory trace. This in itself is a great psychological benefit of drawing. Drawing is a perfect way to express inner emotions and feelings without words. One can easily overcome shyness and bump-up self-confidence. It has been seen that people who are involved in a creative activity have better consciousness as compared to the ones who don’t. So, pick up the brush and start painting your imaginations. One can simply improve their communication skills by getting in the habit of drawing and painting. Since art is the only way to express feelings without verbal communication, one can project their unutterable emotions through art activities such as turning photo to portraits. Art is effective in helping people break free from their personal limitations. It enables individuals to surpass their weaknesses, which include shyness, autism, and other disabilities. Bilateral coordination is the ability to coordinate both sides of the body for efficiently completing different activities. The ability to use both hands and arms together or both legs at the same time, as well as coordinating the movement of both legs and arms together are some of the bilateral coordination skills that are imperative in our overall development. Most of us have well-developed bilateral coordination skills, and hence we do not face challenges while accomplishing activities like skipping, typing, etc. But for children with special needs, bilateral coordination can be hard to develop. Art plays a key role in developing bilateral coordination. Crafts like coloring, painting, cutting and drawing, etc. need to use both the hands and hence help in developing bilateral coordination. Everybody agrees that making art is an effective way to enhance creativity. 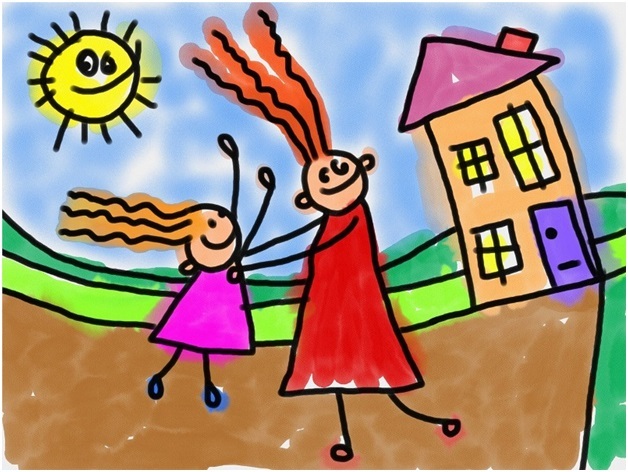 But apart from boosting creativity, art also improves fine motor coordination. 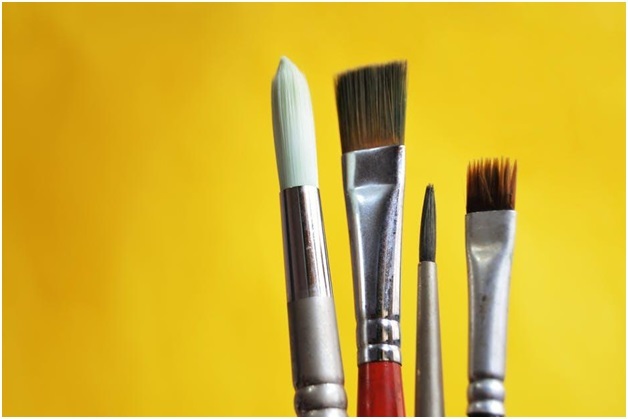 When an individual engages in any form of art as a hobby, dexterously handling a paintbrush ultimately leads to increased mobility in the muscles of hands and fingers. Other activities like tearing and scrunching paper, pinching clay into pits, threading beads, etc. are all ways to exercise fingers, hands, and wrists. Motor skills improve as you gain dexterity; strength and flexibility; and hand and eye coordination after working with different kinds of objects and materials. The fine motor skills developed with art eventually become mental shortcuts that are implemented by our brain in day-to-day life. Often referred to as simple self-control, self-regulation is a crucial skill that must be acquired. Research suggests that most problems, including several health and mental issues that plague individuals of all age groups are in a way related to an inability to control different aspects of oneself. It is observed that kinesthetic-sensory qualities of art can potentially enhance self-regulation among individuals of all age groups. Furthermore, art demands patience - an important self-regulation skill. Creative art is a way of self-expression. Unexpressed thoughts can damage the well-being. Art lets one express feelings and thoughts in a healthy manner and gives something positive to focus on. It is an enjoyable experience that renders a sense of accomplishment and pride when we create something new. The accomplishment achieved from creating art translates into our self-esteem and boosts our confidence. For individuals continuing the processes, they continuously improve their skills and master the art. These artistic ways of representing one’s perception play a significant role in improving one’s thought process. You would be surprised to know that sketching and painting can also enhance your problem-solving ability and critical thinking. The logic is simple - One can realize that there can be more than one solution to any problem. Thus, individuals with average IQ are advised to take up art. Starting from a blank sketch pad, finalizing the art, one gets numerous out of the box ideas that trigger enhanced brain functionality. These little ideas pay off in the long run. An art lover will always quickly offer creative solutions to challenging situations. Well, no one loves to emboss their negativity in their creativity. Creating artwork with the correct combination of colors and with a perfect blend of creativity, one just enhances the positive emotions. The entire accumulated negativity gets replaced with the positivity of strong emotions. Of course, the better one's skill gets, the finer the results. This triggers the feeling of satisfaction and greatness as a person witnesses his capabilities. Involvement in such activities significantly enhances the self-esteem and inspiration to believe in one’s achievements. The mind and body work harmoniously when you feel good about yourself, thus: make every effort that can augment their mental health. Having self-confidence is a vital part of remaining positive in every phase of life. When a person puts his emotions on canvas, he focuses on relieving all those negative emotions that are hidden inside. It is the perfect way to cleanse your mind and bring positivity. Furthermore, surprising relief from physical pain is seen in patients that enjoy coloring their thoughts on canvas. For instance a 2006 study published in National Center by Biotechnology Information suggested that mindfulness art therapy significantly reduced symptoms of physical and emotional distress among women with cancer. 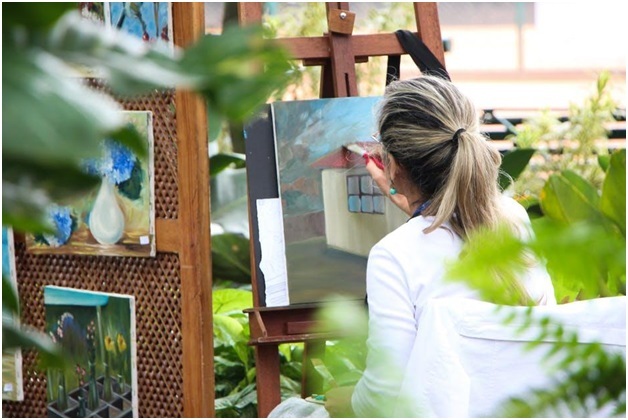 In another study, researchers concluded that art therapy notably comforted adult cancer patients and motivated them to continue with the therapy. Arts and crafts are fruitful for treating patients having a critical mental illness and recommended by several neurologists. A proportion of the brain is unconscious, and activities like meditation, listening music, and painting activate the unconscious part of the brain that releases positive energy, which revitalizes an individual, both physically and mentally. It also augments one’s emotional intelligence that provides a flow of emotions through an art. It becomes difficult for some individuals to express their thoughts, and painting and fine arts is the best way to overcome this dilemma. The untold emotions need to be carried out from the mind to enhance positivity in life. Furthermore, art therapy is also proven to be fruitful for several non-psychotic mental health disorders. Art therapy is capable of enhancing emotional intelligence by putting us in touch with our inner feelings. When an individual uses art as a means of self-expression, he tends to think ponder over how he is presently feeling and what the cause behind those feelings is. Art can be used to express anything a person is feeling at a certain moment, whether it is happiness, sadness or anger. When art is used to express feeling, it provides a cathartic release during the activity. While enabling our emotions to flow through art, we get a better grasp over our feelings. 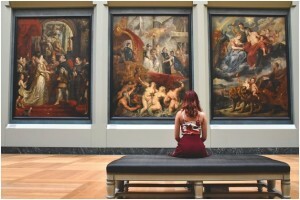 A growing body of researchers underscores that there is a positive connection between the creative process of making art and our personal happiness. This was first established by Robert Epstein back in 1996 when he published an article on “Capturing Creativity” in Psychology Today. Robert extolled the joys of creating art remarkably noted that greater creativity breeds greater happiness. 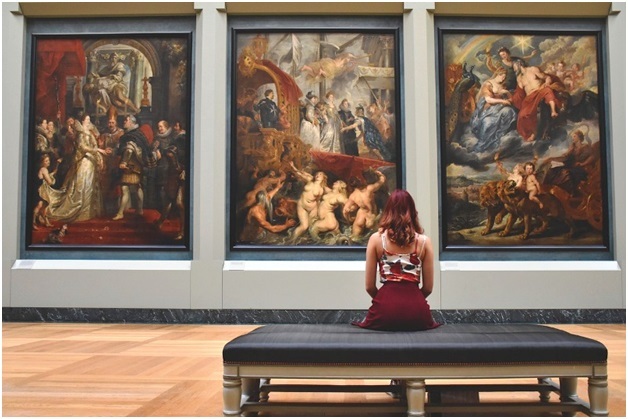 Even a more recent research by SemirZeki, University of London, suggested an increase in dopamine and activity in the frontal cortex of our brain on viewing art. The release of dopamine results in feeling of pleasure and positive sensations that are experienced immediately after witnessing a stirring work of art. Art is undeniably a powerful therapeutic tool. Throughout history, visual expression has been used as a form of healing. Talent isn’t a key element when it comes to art therapy. Art therapy revolves around the concept we all have a gift of creativity within us. When our inner creativity unfolds, it takes us on a healing journey and renders benefits like personal growth, self expression and wellness. 44 million people suffer from some form of dementia worldwide. Dementia affects our brain’s reasoning ability, memory, communication skills and the ability to effectively perform day-to-day activities. Alzheimer’s disease is the most common form of dementia. Engagement with art activities holds the ability to boost our overall well-being. Several case studies and researches suggest that art therapy can help Alzheimer’s and dementia patients by improving attention span, self-esteem and social behavior while helping with neuropsychiatric symptoms and psychological resilience. Art is a popular therapy for the patients coping with cancer and their caregivers. Cancer patients often experience feeling of anxiety, frustration, fear, sadness and depression, etc. These feelings can be difficult to express in a conventional support group. In most cases, individuals going through such traumatic experiences like cancer often internalize their pain and suffering when they aren’t provided an effective means to vent their feelings. Art allows people to express their thought, feeling and experiences that are way too agonizing to put into words. Art activities help in maintaining the health and quality of life of aging adults. Elders benefit from the improved cognitive and tactile abilities and subjective wellbeing from art related activities. It acts as preventive measure for several age related illness. Art activities that enable people to work together is believed to boost self-esteem, psychological health and social engagement, which plays a great role in improving the quality of life of older adults. It is no new fact that more than half of the world’s population is affected by mental or physical stress in some way or the other due the growing changes in the current fast paced lifestyle. . The modern hectic life has eventually affected the lives of individuals that have certainly incremented the number of diseases. Therefore, even a small effort to help escape the daily pattern of life and release stress can do wonders in maintaining healthy lifestyle. Getting involved in some or the other artworks is perhaps the best way to shun mental stress. Plentiful individuals utilize their time in creating some masterpieces to release their anxieties that isn’t possible otherwise via other methods. It becomes essentially important for everyone to stay physically fit and mentally alert to cope with the chaotic life. According to medical practitioners from around the world, making yourself busy with a little excitement and fun could be the finest medication to release mental strain. Henceforth, anyone can simply free them up from the pressure that has accumulated in the mind. The Journal of American Art Therapy Association published a study is 2016. Saliva samples of 39 healthy individuals were taken to evaluate the level of cortisol before and after 45 minutes of making art. The results from the study suggested that indulging in art significantly lowered the cortisol levels and the participants felt much more relaxed after the art session. Creating and appreciating art, both, lead to a reduction in the cortisol or the stress hormone levels. Apart from this, a healthy mind can prevent many other ailments. People with lower stress levels are at a lower risk of getting a heart-related trouble as compared to the ones who are always stressed. Releasing your psychological tension becomes necessarily important to reduce the risks of serious physiological illness. Who would have thought that a stress-buster can become an addition to your skillset. We all face ups and downs on a daily basis. Mostly feeling down in dumps during certain periods of hardships or transitions is pretty common for everyone to experience. These feelings and mood swings are a part of life. But that does not mean that we should not do anything do get over them. During such times simple doodling and moments of intentional creativity can act as very effective mood-boosters. Creativity helps in uplifting our mood by making us feel productive while creating something from nothing. In a study published in the National Center of Biotechnology Information, it was revealed that our control over emotional pain and depression is significantly enhanced by creativity. Self-reflection and a deeper understanding of ourselves play a great role in enabling us gain better control over our emotions. Now you know how to get rid of those days when you are feeling low and unproductive. A healthy social life is another very important factor in determining our overall well-being. Our mental health can easily crumble without the support from a solid community of friends and family. Since people tend to bond over common interests and experiences, art presents an excellent opportunity to connect with likeminded people and cultivate a healthy social life. Socializing over creative art activities is known to promote happiness and better connectivity with the outside world. Self-love and respect is very important for sustaining in today’s world and you tend to attain that by giving yourself time and priority. Art makes us take some time out of our busy schedules and leads us to a place of utter peace and serenity. The therapeutic powers of art allow the mind to concentrate only on the images at hand and nothing else. Focusing towards one thing at a time keeps us distracted and ultimately helps in releasing stress. It relaxes the body and has similar effects as that of mediation. 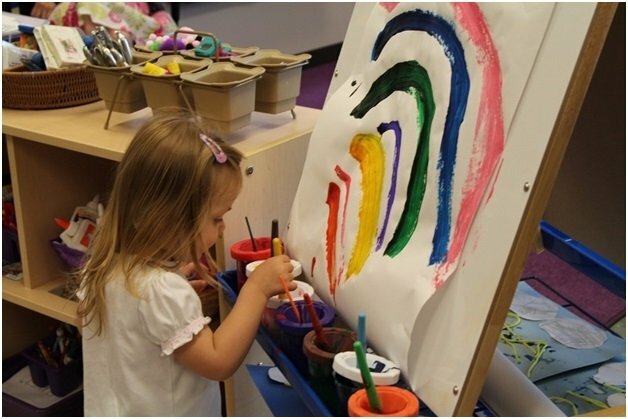 Creative activities like art act as building blocks for sound child development. Art education is closely linked to better academic achievements, higher civic engagement, superior social and emotional development, and equitable opportunity. Participation in art is also associated with the development of critical thinking, cognitive ability, verbal skills, reading and mathematical capabilities in children. Furthermore, art also improves concentration, confidence, motivation, and teamwork. 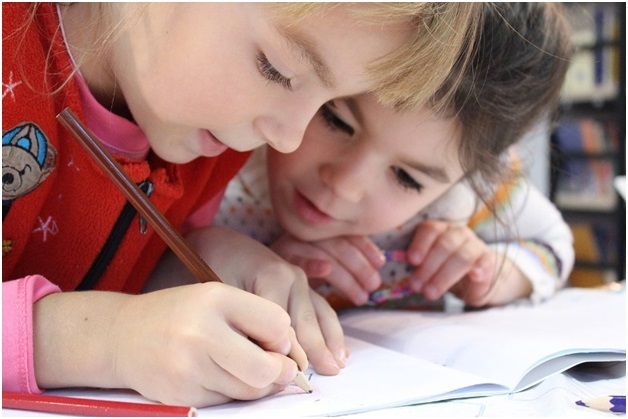 When it comes to language development among children, pressuring them to view flashcards and worksheets, or making them memorize lists is an ineffective method. The simple reason behind the inefficacy of flashcards, lists, and worksheets is that these are one-dimensional tools. Children learn better when they are more engaged and involved. They need to experience something to understand it fully, and art provides an excellent opportunity to build vocabulary, develop articulation skills for ideas, and hone observational skills. When ideas are presented in visual form, students are better able to understand what is being presented verbally. 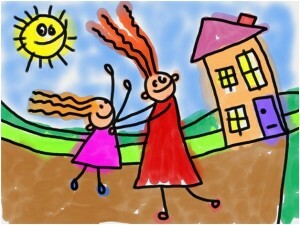 The benefits of drawing in early childhood can clearly be seen among children when they grow up. Present day toddlers as young as two years of age now know how to operate a Smartphone. 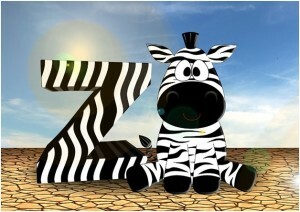 This means that kids grasp visual information more quickly and easily. 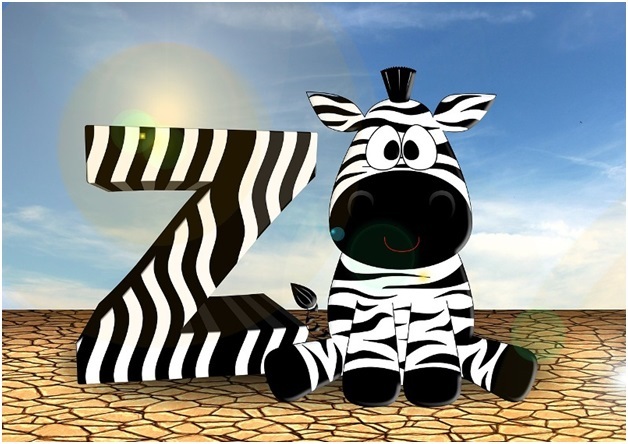 Children learn a lot more from visual sources rather than through texts and numbers. Artistic activities like drawing or sculpting with clay are all known to develop the visual-spatial skills and teach students to interpret, evaluate, criticize and use visual information. Visual arts improve learning capabilities greatly. Even a research conducted by National Center of Biotechnology Information revealed that learning of science can be enhanced when taught in relation with visual arts. The positive impact of art on children is further illustrated by how art helps develop inventiveness. Systematic artistic engagements nurture a child’s creativity and enabling them to take risks in creating art. It helps develop a sense of innovation and acts as tool to stimulate and enrich the learning experience. Art offers a unique way of knowing and understanding the world around us and allows us to explore the same in a structured manner and enjoyable way. It instils habits of mind like critical analysis skills, problem-solving and a drive for excellence that translates into new ideas, new experiences and new challenges. We all love finding people who have the similar interests as us and spending time with them. When it comes to kids, art allows kids who don’t know one another and don’t have any similar interest to establish a common ground and connect with each other. Art acts as an equalizer and brings children speaking different languages and belonging to different ages, races and regions to engage in a shared activity that is appreciated mutually. The power to make decisions develops over time and age for any person. It portrays the sense of rationality and maturity a person possesses. The process of drawing involves making decisions about what we plan to portray on the canvas and how it can be achieved most efficiently. Whether it’s choosing which brush to use or what colours should be mixed together to create the hues you want to splash on your canvas; every step of painting involves analysing and decision-making. If the hand drawn portraits don't come out as planned, we tend to pause and figure out a way of fixing it. Artistic activities involve decision-making and problem-solving at every step during the process, which ultimately improves our analytic and reasoning skills. Popular for being a pastime that has been endured for generations, painting/sketching remains one of the most enjoyable activities for kids as well as adults. However, the above-mentioned benefits clarify that painting is much more than a vocational hobby or an occupation. Artistic endeavours can be incredibly therapeutic. Involvement in art helps boost the mental and physical health of an individual in ways more than one. Art renders numerous advantages that encompass mental health, emotional support, better quality of life and developmental benefits. The best part is that you don’t need to be Van Gogh to enjoy those benefits. 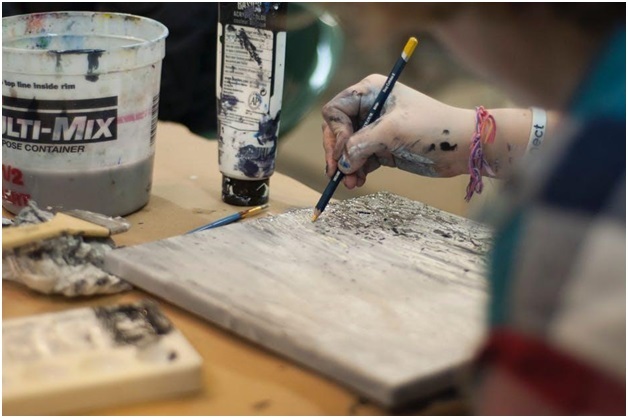 Some simple tools, a blank canvas, and beautiful colours are all you need to reap the excellent health and developmental benefits of engaging in artistic activities. PS: Don’t forget to frame those masterpieces and enhance your walls just like your mental and physical well-being! It was interesting to learn about how creating art can have mental and emotional benefits. I loved how you mentioned that you don't need to be Van Dough to do this. It was a nice reminder that anyone can indulge in artistic activities. So, you really painted all this pictures? Thanks for the feedback, Dimas! I like how you explained that art can teach children self-regulation. It makes sense that the kinesthetic-sensory qualities of art could possibly help them develop skills that teach self-control. My son has little-to-no self control as a result of his ADHD. Maybe finding him an art class will be the thing that helps him. I certainly hope it does.. I find it interesting when you said that a person exposed to art can help enhance their positive emotions while improving an adult's quality of life. Reading this fact gave me an idea of what I can give my sister for her birthday next week. I will look for an artist this weekend so that I can schedule a drawing session where he will make a portrait of her. Doing this will help her be proud of who she is today and make her birthday more memorable.